A "Hostel" Discovery! Very Affordable Lodgings! Where could I afford to stay during this road trip? No way could I afford to stay in a hotel or motel. Campgrounds were my first choice. Then I remembered hearing something about "Hostels" way back in the early 1970's when I lived in Italy for a couple of years. We lived near Venice and I remembered meeting tourists who said they were staying at the hostel there. I had never seen a hostel, and I never thought I would. But while I was planning this trip, I became curious and wanted to find out more about hostels. So I looked up "Hostels" on the Internet. And that's how I became interested in hostels. The more I learned about them, the more I became convinced that perhaps this was the way to go. I discovered an organization called "Hostelling International" and learned that it is part of the International Youth Hostel Federation. Hostels USA Handbook pictured on the left. This is a great handbook! I kept it by my side at all times--it's a lifesaver when you're in the middle of "no where", exhausted, and looking for a safe place to sleep, eat & take a shower! Hostels USA lists hostels with various affiliations, and it also includes some independent hostels. There are other hostel handbooks out there, but this was my favorite--although I learned that it did not contain all the hostels that I found during the trip. 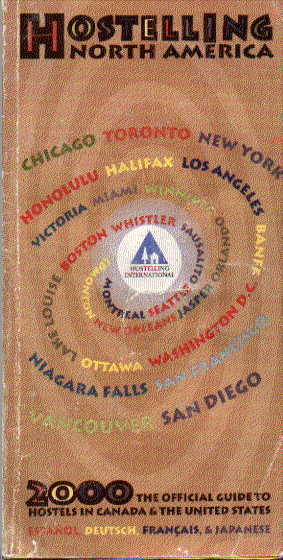 So I also carried the "Hostelling North America" with me. It's also good to ask other hostellers that you meet what hostels they've stayed in. Sometimes the new hostels aren't in the books yet. For example, when I got to Whitehorse in the Yukon, I took out my trusty Hostels USA--but there was nothing listed for Whitehorse! Then I checked Hostelling North America--Nothing! Dang! I was so exhausted from driving all day, I could hardly see straight! And then I discovered there were no hostels listed in my handbooks! I usually plan pretty good, but like I've mentioned--driving to Alaska was not in my plans. So I was "winging it". 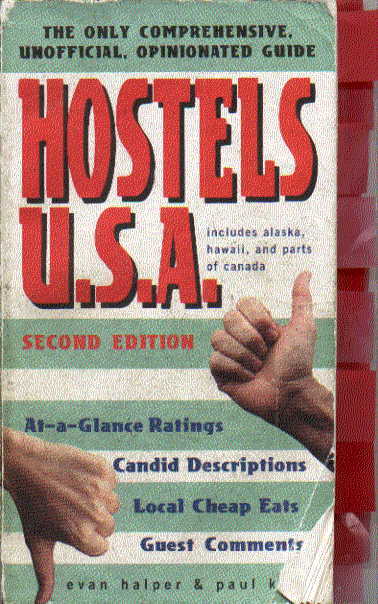 The Hostels USA book says that there are over 5000 member hostels in seventy countries worldwide. Besides Hostelling International, there are other affiliations like Rucksackers International, and many, many independent hostels. They are all over the place--if you know where to look for them! And I never knew they existed until I started doing research for this road trip. I was pretty tense. So I pulled into a restaurant for a cup of coffee (ya, just what I needed--caffeine), and to check my map. It was still a long way to Alaska. The closest hostel listed in my handbook was in Dawson City, and that was a long way off! We're talking hours of hard driving after I'd already put in a full days driving! So I decided to drive into Whitehorse and look around. Lo and behold, there on the side of the road was a little sign stuck into the ground--it said "Hostel" and had an arrow pointing toward Whitehorse! What a relief! Now I knew that somewhere in Whitehorse there was a hostel! Went to the Chamber of Commerce and asked them if they knew where the hostel was. They did. I slept very well that night (even though it never got dark). So the moral of the story is...there are hostels out there that are not listed in the handbooks! I better get back to the subject at hand..
One thing that I learned early in my trip was that the attitudes of the people that I came in contact with, whether it was a campground host or a hostel manager, made a big difference in not only how I felt about staying there--but how I felt overall. I don't know if it was because I was traveling, and usually a little stressed out from sometimes driving too long in between stops, but it made a huge difference when I was greeted with a friendly smile or treated with total indifference (and on a rare occasion--outright rudeness). But, I guess that's how it goes in all aspects of our lives. Our attitudes toward one another make a big difference in our lives no matter where we are. Sometimes we forget how much our actions and comments can affect others. All I know is that it was never quite so apparent to me as it was when I was out there on the road alone and far from home for 3 months. I hope that I have learned to smile more and show a little more friendliness towards others. For the most part, the people I met were wonderful, friendly, open, and warm. I had a great time meeting new people, and creating new friendships with people who I still correspond with today. AND I CAN'T WAIT TO TAKE ANOTHER TRIP!!! OK, So What is a Hostel? Well, I've discovered that it's much more than an inexpensive place for travelers to stay (prices range from approx. $8-25/night). As you will see from the pictures that I have taken and the notes that I wrote, there are all kinds of hostels. All kinds. But basically they all provide a safe, inexpensive place for the traveler to stay for a night or two. Most have separate male & female dorms, some are co-ed. Most have kitchens that are open for everyone to use. You buy your own food at the grocery store and bring it back to the hostel to cook it. If you have any left over items that you don't want to carry with you, you can leave them in the "free food" cabinet for someone else to use. Many hostels have community rooms, or TV rooms, some have game rooms. Some have swimming pools! And one that I visited in the Yukon had an outhouse & you had to chop wood to heat water for a bath! Like I said, there are all kinds of hostels--and for me, that's what makes hostelling so much fun!! It's not just the traveling that I enjoy--It's the whole hostelling experience that helps make the trip unforgetable! Above is an example of a "Home Hostel" , Grandma Shirley's in Fairbanks, Alaska. She offers a spotless 9 bed co-ed dorm in the upstairs of her home. The kitchen & bathroom were equally spotless. 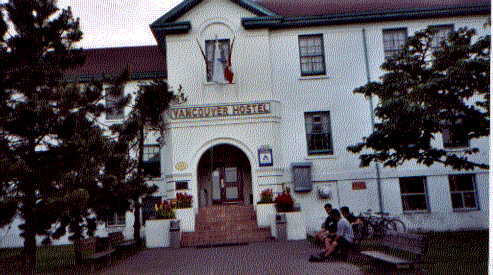 Above is an example of a large, busy hostel: The Jericho Beach Hostel in Vancouver, BC. Male & female dorms, 286 beds. They also have 2 private/family rooms w/private bath. Here's an unusual hostel. It's the Yellowstone Yurt Hostel in Cooke City, Montana. 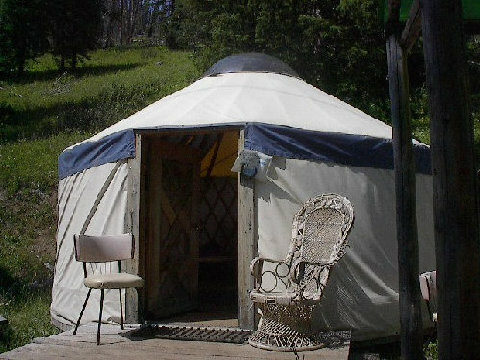 When I read it's description in the Hostel USA book, I just had to come and see what a Yurt was. I'm not afraid to rough it and try new things. It was comfortable, clean, and had a beautiful view! 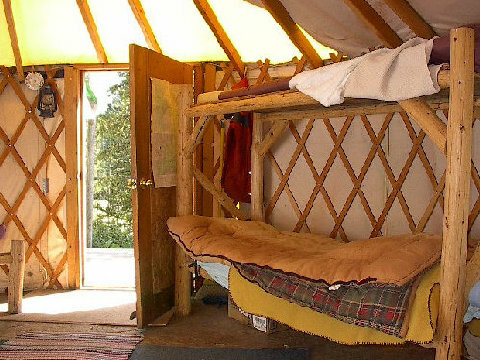 Here's what the inside of the Yurt Hostel looked like. It was surprisingly bright & airy. Only room for 6 hostellers. That's my bottom bunk. I was the only hosteller that day. The bathroom, little kitchen, and storage area were in another building. The very first hostel that I stayed in was in the year 2000. It was the Tyler State Park Hostel in Newtown, PA. It was a big, old farmhouse with a friendly manager who made me feel right at home. It was an excellent introduction to the hostelling experience. The last hostel that I stayed in was in October 2001. It was Bell's Mountain Hostel located in the Smokey Mountains in Gatlinburg, TN. The accomadations ranged from choosing your own little cottage or staying in a room that was much like a motel. Once again the scenery was beautiful. I am so glad that I discovered "Hostelling". Without the use of hostels, I never would have been able to afford to drive around the country and "discover America" and all the beauty & diversity that it has to offer, and to meet people from all over the country, and the world. It's just fantastic! A couple of years ago I never would have guessed that within 2 years I would be able to say that I 've driven across the US twice, and stayed in over 50 hostels in the US & Canada. To me, it's just remarkable. Unless you're really into traveling and seeing new places, that might not seem like much of an accomplishment. But for me, it is an accomplishment--it's something I never thought I could do. And I am so glad that I did it, and that I am able to share it with others who are also interested in this sort of thing. Well, I guess that's about it. Hope you enjoy the rest of my web page!